Character: Although he is only 13 years old and is not physically fit, Chiriko has an unbelievable intelligence (high IQ). He loves reading since he was a kid. Almost every book in the world has been read by him. Unfortunately, his intelligence can only be used when his seishi word appears on his foot. Once the word disappears, he is similar to kids at his age, and cries easily. He personally is not confidence on his physical appearance, and hopes to be a stronger man. 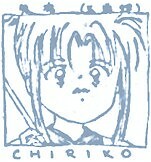 Chiriko is a gentle and stable person.